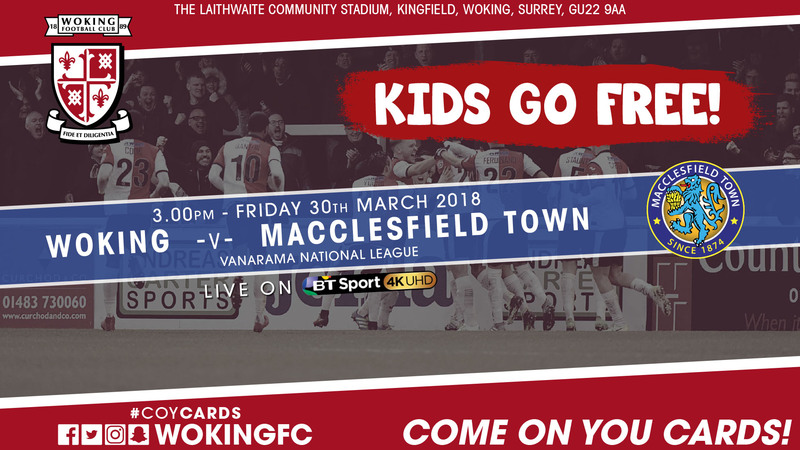 Woking Football Club | News | Kids Go Free on Good Friday! Kids Go Free on Good Friday! Woking Football Club is pleased to announce that all under 16s will receive free entry to our Vanarama National League match against Macclesfield Town on Friday 30th March, 3pm kick off. Why not treat the kids to hospitality in The Geoff Chapple Lounge? We've launched a new menu just for kids, priced at £15 for this match. Bring all your friends and family down to The Laithwaite Community Stadium for this big match, which is also live on BT Sport!